Huddled in the trenches of northern France, soldiers on both sides of World War 1 began to adopt a 'live and let live' attitude towards their enemies, agreeing informal truces to recover the dead and wounded or simply enjoy a little peace. As the story goes, on Christmas Day, 1914, occasional indifference to enemy activity culminated in a carol sing-off and an international football match amid the devastation. 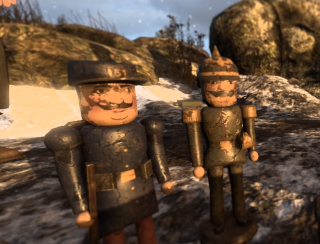 The scale and details of the event are contested by historians, but it's a heartwarming tale to come out of an otherwise black period, and the fantasy has made for one of the best holiday events I've seen: the Christmas Truce is in place in WW1 shooter Verdun. Players entering a dedicated winter map will be able to throw snowballs and play football with the opposition until January 4. Apparently you can partake of carol singing, although your teammates might not thank you, and even write Christmas cards (emails) from the front lines for a chance of winning Verdun keys for your friends. For the duration of the event, Verdun will be 40% off.